The Duluth Forge Berkshire Stacked Oak Vent Free Log Set features Patented Dual Fuel Technology which allows you to purchase this log set for LP Gas or Natural Gas. 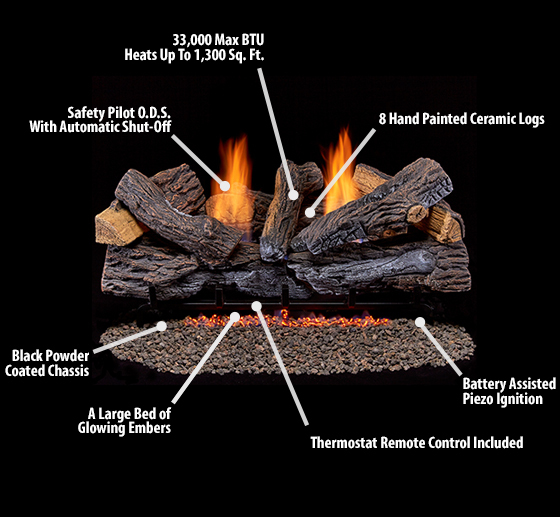 This unique log set offers a natural look and feel of a real wood-burning fireplace. The log set was developed from real wood to reflect a split stack with focus on blending bark and split features along with charring to create an exquisite look to your fireplace and magnify the beauty of your home. The Thermostatic Remote Control feature can easily regulate the 33,000 BTU to create the perfect heat setting for your home. Lava Rock (LAVR1) and Ember Log Kit (FELK) Shown In Picture Not Included.